Updated September 15th, 2006, with Radeon X1900 XT results. 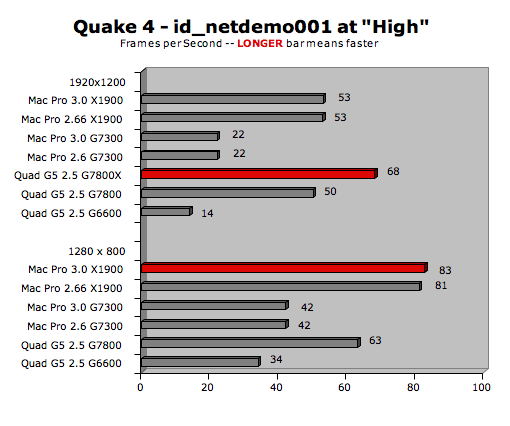 Quake 4 (1.20) Settings: High Quality, Widescreen, No Vsync, No Anti-Aliasing, all other advanced settings enabled including multi-processor mode. 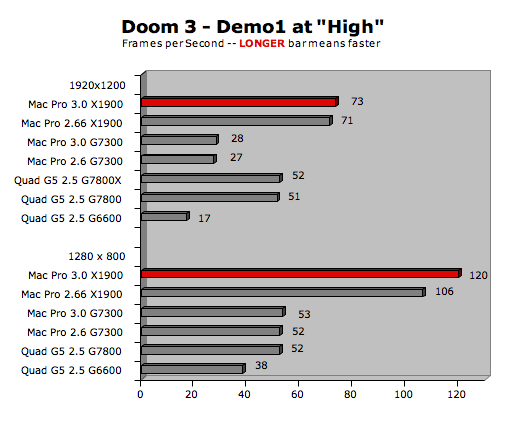 Doom 3 (1.3a) Settings: High Quality, No Vsync, No Anti-Aliasing, all other advanced settings enabled. Halo (2.0 UB) Settings: All parameters enabled and at highest quality except Lens Flare which we had at a low setting. No FSAA. Sound disabled. UT2004 (build 3369.2) Settings: Using SantaDuck Toolpak, we ran the Inferno Botmatch with Graphics Enabled, Sound Enabled, and Maximum Quality Settings. The Mac Pro with a Radeon X1900 XT is a Mac gamer's dream come true. We finally can run with the "big dogs" of the PC world. 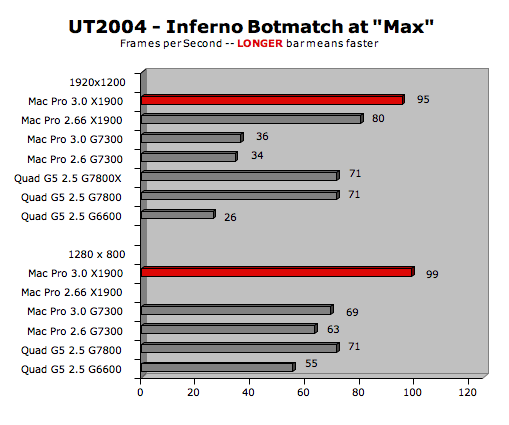 Though the Radeon X1900 XT "whups" the GeForce 7300 GT, we were surprised to find out that Apple "detuned" the X1900 XT to run at 600 core clock speed and 650 memory clock speed. In the Windows PC world, a Radeon X1900 XT typically runs at 625MHz core clock speed and 725MHz memory clock speed. And it does NOT dynamically "up-clock" when you run OpenGL 3D games as in the case of the MacBook Pro 17". But there is some good news. You can use Graphiccelerator 1.3.2 to change the ROM code so it runs at "normal" speeds or even better. (The memory clock is rated up to 900MHz.) For example, one user has his X1900 XT running at 650MHz core clock and 775MHz memory clock speed -- which turns it into an XTX. Of course, that may cause the X1900's fan to run more often. 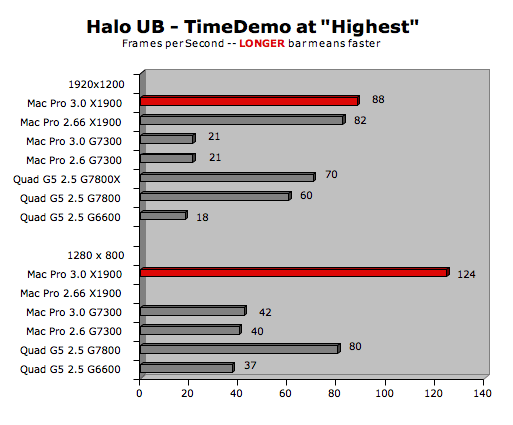 We have to warn you that overclocking your X1900 XT can potentially "hurt" it or "kill" it. As for dealing with a noisy fan, one of our readers replaced his heatsink/fan assembly with the ARCTIC COOLING Accelero X2 selling for $22 at NewEgg. Can you use Windows PC PCIe graphics cards in a Mac Pro? NO, you can NOT. That's because Apple uses the Extensible Firmware Interface (EFI). Get the whole scoop in THIS ARTICLE. Nor will the G5 Power Mac PCIe cards work in your Mac Pro -- for the same reason. Can you use G5 PCIe graphics cards like the GeForce 7800 GT and Quadro FX 4500 in a Mac Pro? No. Some of you are asking for us to include more than the Quad-Core G5 in the comparison. We are trying to decide what to include that's meaningful. For sure we will add the Dual Single-Core G5/2.5 running a Radeon X850 XT and a GeForce 6800 Ultra. Suggestions welcome. Email , the evil mad scientist. The GeForce 7300 GT (16X, 256MB, dual-link DVI + single-link DVI port) is standard. However, we recommend the Radeon X1900 XT (16X, 512MB, two dual-link DVI ports) as a CTO option. It's much faster than the GeForce 7300 GT and just a hair slower than the outrageously expensive Quadro FX 4500. To custom order your Mac Pro with the Radeon X1900 XT, go to the Apple Store and click on the Mac Pro graphic. Fortunately, you can order the Radeon X1900 XT as an aftermarket kit. We ordered our Mac Pro with the standard GeForce 7300 GT so we could get it within a few days. The X1900 XT we ordered separately was back ordered for 5 weeks. Click THIS link (or any Apple link on this page) to order your X1900 XT kit so we get credit for the sale. If you live in the USA and plan to purchase an APPLE product, please CLICK THIS LINK or any APPLE DISPLAY AD to help us earn our affiliate commission. It's a great way to support Bare Feats. Readers in Canada should visit Apple Store, Canada. Readers in France should visit Apple Store - France. Readers in Germany should visit Apple Store - Germany. Readers in Italy should visit Apple Store -Italy. Readers in the United Kingdom should visit Apple Store - UK. You can order extra Mac Pro memory from Apple USA when you custom order your Mac Pro, though it might delay delivery. Plus, we think Apple charges too much for their memory upgrades. We recommend getting your memory upgrades from third party vendors. In our initial Mac Pro testing, we used kits provided by Other World Computing. They are a good source for quality memory at a reasonable price. Plus OWC has a "Trade In Your Factory Memory" REBATE program. TransIntl.com is shipping Mac Pro memory with Apple suggested heat sink specs. They took great care to engineer their heat sinks for maximum thermal efficiency using 6 fins on each side (versus 4 on the Apple factory modules) and special aluminum alloy. We tested these and can vouch that their heat sinks are truly efficient in absorbing and dissipating heat. MaxUpgrades offers their unique "MacSink" design for a heat sink (using 2 clips instead of 4) which results in more fin area exposed to the airflow. We've tested them and they are very effective. MaxUpgrades will sell you the memory with the heat sink or just the heat sink. Their prices are very competitive, too. We also tested the Data Memory Systems Mac Pro memory with conventional heat spreaders. It ran an average of 10 deg F warmer than the memory with "fat finned" heat sinks. DMS is also offering memory with Apple approved" heat sinks as an option. We just bought the newest, lower priced ($999) 23" Cinema display with the improved brightness and contrast. We love it. And the pink hue on gray screens is gone. The 20" model is down to $699. We know we've sung the praises of the Dell 24" Ultrasharp in the past but we are partial to the sleek looking aluminum Cinemas -- especially with the latest improvements. But if you still want to go for the Dark Side -- I mean -- Dell, it's on sale for $703 right now. For more details on it, read our updated review of the latest model.